A recent study shows that a virtual reality (VR) coach can effectively deliver psychotherapy to help overcome a fear of heights in people with this phobia. It thus offers a proof of concept of the success of automated VR therapy for some mental conditions, which could dramatically increase access to psychological treatment. This is important since the number of experienced therapists available to treat such conditions is well short of the demand. 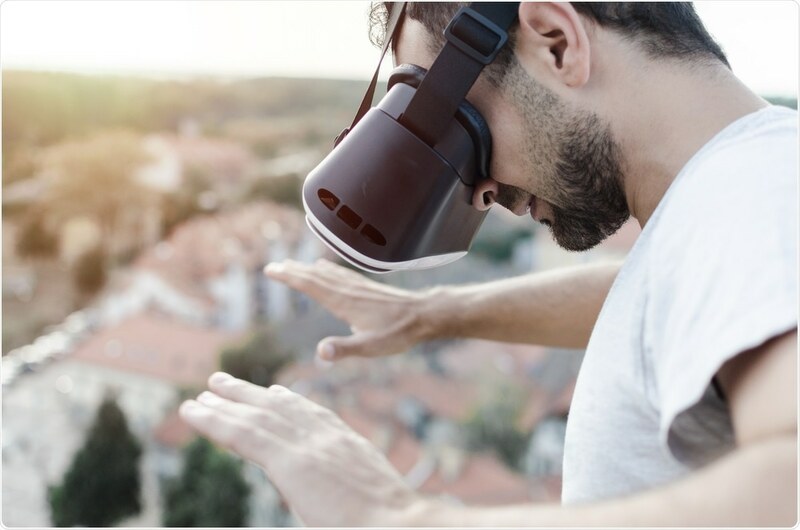 Previously, people with a fear of heights had been proved to show comparable improvement following either VR training along with a therapist or real-life exposure therapy, and that the improvement was maintained for a year or more. The present study consisted of a randomized control trial with 100 subjects who had suffered from a fear of heights for 30 years on average. This is the most common phobia in the world, being reported by about 20% of people at some point in their lifetime, and diagnosed in approx 5% of the population. The subjects of this trial completed a questionnaire about their phobia before the trial began, two weeks after the therapy ended, and four weeks after the trial ended. One group of 49 people was treated with fully automated VR in approximately 6 sessions of 30 minutes each, held over two weeks, while the other group of 51 people received no treatment. First of all, the participants talked about their fears with the VR coach, including the specific cause for their fear, whether of falling, of building collapse, or of throwing themselves off the building. At the end of this first session the coach instructed them about the basics of the phobia. From the next session onwards, using a VR headset, the participants were exposed to heights in the form of a VR building with 10 floors and a large atrium. Easy challenges included looking at a safety barrier at the edge of a steep drop, that was slowly reduced in height. Harder tasks included moving out on a platform over a big drop, throwing balls over a drop, or getting a cat down from a tree. They were constantly encouraged by the coach throughout the activity. At the end of the session the coach discussed the participant’s learning from the specific activity and asked if they felt safer after it. A “homework” activity was also offered, namely, trying to face real heights before the next session. 44 participants completed all the sessions, with one person being unable to attend further sessions, and two people expressing unwillingness to do so as they felt it was too hard. After the completion of VR therapy, the fear of heights remained unchanged in the control group, but was decreased in the VR participants. At the four week follow-up, in fact, 34 out of the 49 original participants did not have fear of heights any longer. No participant reported any adverse event. Participants were positive about the effects of the VR treatment, saying they noticed rapid recovery from initial anxiety when exposed to a height, following the therapy. The importance of the study, according to the lead author, Professor Daniel Freeman, University of Oxford, is that it shows that immersive VR treatments, carried out without a real-life therapist, can make psychological interventions available to much greater numbers of people compared to treatments that need skilled therapists, who are limited in number. With our unique automation of therapy using virtual reality there is the opportunity to provide really high quality treatment to many more people at an affordable cost. Our study is an important first step, and we are carrying out clinical testing to learn whether automation of psychological treatment using virtual reality works for other mental health disorders." While this form of therapy is cost-intensive in the software development phase, with the need for detailed and constant input from psychologists, programmers, scriptwriters and actors, the costs are significantly low in the long term since it avoids the need for a therapist during each session and makes use of inexpensive VR headsets. The authors identified some limitations, such as the lack of a direct comparison between currently utilized psychological treatments for phobias (counseling, cognitive behavioral therapy or psychotherapy) and the automated VR therapy. Also, the participants were self-referred which may have introduced some degree of selection bias. Finally, the authors evaluated the severity of phobia initially on the basis of self-completed questionnaires rather than patient assessment in real-life situations. They point out the need for further research to pinpoint the portion of the treatment that is responsible for the clinical effect. Past trials have shown that the effect of VR therapy in anxiety can last several years. The duration of the current trial was very short, and longer periods could result in more sustained benefit. The question remains whether VR therapy will be equally effective in more serious conditions such as psychosis which are currently treated only by mental health professionals in one-on-one sessions. It is already known that treatments focused on specific symptoms such as auditory hallucinations produce promising results with potentially greater effect sizes, but are presently available only in personal therapy by experts. Studies are needed to confirm the place of VR in increasing access via automation, and improving effect size by virtual exposure therapy.